18-hole, par 72 links-style championship course designed by Rick Jacobsen. Bentgrass greens, fairways and tees. Panoramic views of Blue Ridge. From I-81:Take exit #188-A. Follow Rt. 60 east. 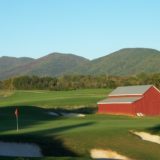 The entrance to the golf course is on the right.From the Blue Ridge Parkway:Exit at mile marker 45.6. Follow Rt. 60 west. The entrance to the golf course is on the left. Adults: $35, Children: $20. Open 8am-6pm.